not list any repeat products, so I'm just showing the things that stood out this month or that are back in my rotation. I can pretty much say that the Chocolate Bar range from Too Faced are my favorite neutral palettes. I have been really liking this one with all the pink and purple tones with pops of warm golds for natural spring time eye makeup! Review here. This with a bit of a bit of MACs Fix+ is cheek glowing magic! I pop this right on the apples of my cheeks. The light catches in a soft, illuminating way that just gives the most natural, fresh look. Full review here. This is the amazing in-a-rush product! I am so impressed with the formula and the packaging is too cute. I just reviewed this so I won't gush too much, but to see more click here. This is my newest obsession! Honestly, anything that gets my very dark circles to look bright is a win in my book. 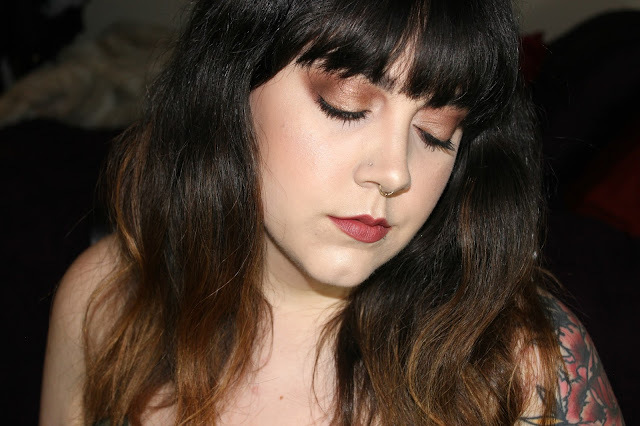 I can not say enough good things about the UD Naked Skin line. So lovely and easy to use. Get all the details here. I'm not normally a waterproof mascara person, but this one has won me over. My lashes tend to not want to stay curled very long. This keeps them up and curled all day! I am a big fan and have plans to try some more waterproof options for summer. I got this, and a couple other shades, but this is the stand out for me! I am in love with this shimmering, cool toned, pink. The packaging is glorious and the product keeps up with it! Full review here. know I love to hear from you.